Nile Basin countries feature population pyramids flatter at the bottom, which is characteristic of populations with younger age structure. The broad base and narrow top of the pyramids also indicate low life expectancy. 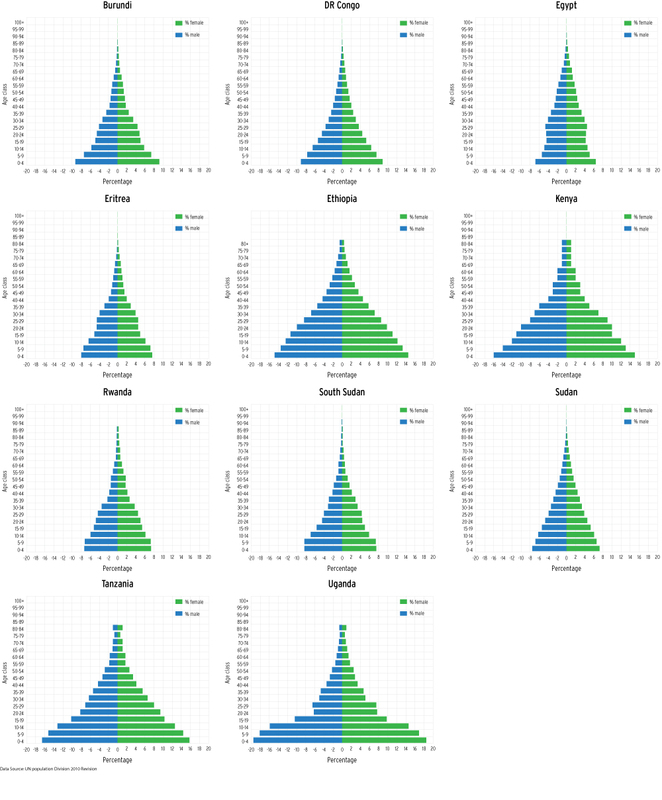 Most basin countries exhibit similar population pyramid structures, with the exception of Egypt, Kenya and Uganda. The population pyramid for Egypt shows a relatively large proportion of the 15 – 34 age group. Kenya, in contrast has the highest proportion of older population (greater than 60 years). Uganda shows a ‘denting’ in the pyramid, which signifies a relatively small proportion of the 20 – 34 age group. Common to all countries, however, is a high proportion of young population, that age group that is 20 years or under. This could be explained by a change in the dynamics of the demography of the basin, particularly a significant drop in infant mortality rates in all countries accompanied by high fertility rates, though the latter has started to decline.